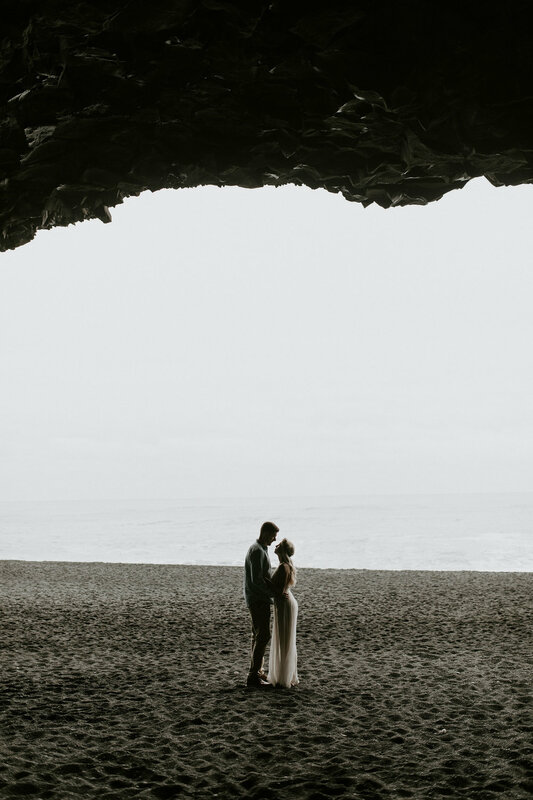 Definitely one of the highlights of my Iceland trip was getting to take Biz + Craig’s engagement photos at the Black Sand Beach in Reynisfjara, where they got engaged the previous February. They literally flew in for the day and we met at the Black Sand Beach, where they relived the moment she said “yes”! We hiked up some cliffs that overlooked the beach to get an amazing view. This spot turned out to be probably the windiest place on earth. We couldn’t stop laughing at how ridiculous the wind was blowing. The next stop was to the cute iconic church in the city of Vik. I loved how the red and white church popped against the beautiful green background! The next stop was the famous Skogafoss waterfall. It’s one of the most popular places in Iceland, and I see why! It was the biggest waterfall I’d ever seen! We got absolutely soaked standing next to it. It was cloudy and overcast all day and the sun came out just as we arrived to Skogafoss, giving us the most amazing double rainbow! On our way back we came across these beautiful Icelandic horses, that we had to stop to pet regardless of the rain. They were the cutest! Also, how amazing is Biz’s dress from BHLDN?! To die for! All of their outfits were absolutely perfect. After we were all photo-ed out, we decided to get some grub. Biz + Craig took me to dinner where we tried some very interesting Icelandic food. I hadn’t had a real meal the whole time I was there so I was really happy to have a proper meal whether or not I could identify the food or not. Th entire dinner we couldn't stop talking about how perfect the day worked out and how much fun we had together. It seriously was a dream session that I will never forget! Biz is a travel guru, and if you are interested in travel you should definitely check out her adorable instagram here!